Ask someone about the “Scapular” and you will likely be told it is a religious object associated with the Blessed Virgin. 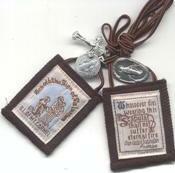 The Brown Scapular consists of two small panels of cloth joined by strings and worn over the shoulders. Generally, one panel bears a woven or printed image showing the vision of Our Lady of Mt. Carmel to St. Simon Stock, while the other bears the image of Our Lady with the Child Jesus. For centuries, the Scapular has been one of the most popular Marian devotions, second only to Our Lady’s Rosary. As a sacramental, it has been enriched by the Church with many spiritual blessings. On July 16, 1261, at Aylesford in Kent England, according to tradition, Our Lady appeared to St. Simon Stock, a Carmelite, and made the Scapular a sign of her protection. With it came the promise that whoever wore her “habit” devoutly would be assured of eternal salvation. This is the Scapular promise of eternal perseverance. Carmelites have always regarded themselves as “Brothers of Our Lady of Mt. Carmel,” and place their lives of Christ-centered prayer under her patronage. ~ Rev. Eamon R. Carroll, O. Carm. The world in which we live is full of material things which have symbolic meaning to us, such as, light, fire and water. There are also, in every day life, experiences of relationships between human beings. These experiences express and symbolize deeper meanings in our lives. Sharing a meal is a sign of friendship; joining together in a national celebration is a sign of our identity. Jesus is the great sign and the embodiment of the Father’s love. he founded the Church as a sign and instrument of His love. Christian life also has its signs. Jesus used bread, wine and water to help us understand higher things…things which we can neither see nor touch. All our Christian celebrations, particularly the sacraments, are signs with special meaning. At the Eucharist the sign is bread and wine; during baptism it is water; as hands are laid on the sick it is the anointing with oil; and in the marriage ceremony it is the giving and receiving of rings. Each of these signs brings us into communion with God, Who, in different ways, is present in each of them. It is a sign approved by the Church and endorsed by the Crmelite Order as an external sign of Mary’s love for us. It confirms our love and trust in her, and our commitment to live like her. With the passage of time,l people began to give symbolic meaning to the Scapular as a sign of commitment to follow Jesus Christ, our Savior, in the spirit of Mary. I have been wearing the brown Scapular for a number of years and it has become like a kind of uniform for me. Actually, in the art of spiritual warfare, I have often heard it referred as just that – the Rosary is our weapon and the Scapular our uniform or shield. I think of it as an extra little sign, a personal reminder of devotion and commitment to the Blessed Virgin, through whom we strive to know and love Jesus and work for the salvation of souls.